I guess I should kind of clue you in that I’m going to refer this morning to the testimonies offered by Glen Harmon and Randy Hart in the last 2 Sundays. If you happened to miss what they said, and you’re curious, I’m sure that someone who was here could share what they heard – or ask Randy and Glen! Both of their testimonies showed the power of gratitude and prayer. And they both told us stories of profound acts of faith. The two scriptural stories we just read are also of profound acts of faith. Both are stories of widows who had almost nothing. Both are stories of widows who chose to give up much more than was reasonable. The widow in the first was challenged by the ancient rule of hospitality – with a prophet at her door, nonetheless! Every Israelite knew that when a stranger came, it was their duty to share what they had. Did you notice? Elijah told her that God promised her enough sustenance if she stepped out in faith. By faith, she rustled up some bread, using her precious oil and flour. By faith, she gave to Elijah and her life was forever changed. In the second story, Jesus had just been teaching in the synagogue, warning the disciples that religion isn’t about being better than someone else. He was watching the priests and the scholars parade around the temple, self-important, shallow of soul and uncaring in attitude, when the scripture says “he looked up saw the rich people dropping offerings in the collection plate. Then he saw a poor widow put in two pennies.” By faith, she gave all she had. We don’t know why. We don’t know the rest of the story. What we know is that she acted in faith and the Savior saw her profound gift. By faith, Noah built a boat. By faith, Abraham left the familiar and went where God told him to go. By faith, Moses – the guy who couldn’t speak so well – confronted Pharaoah. By faith, the Israelites actually followed Moses into the sea. By faith, Jesus Christ walked all the way to the cross. By faith, Glen Harmon changed his way of thinking and began to give thoughtfully to God. By faith, Randy Hart gave up one of his favorite stocks to make a significant contribution – an act that was scary and liberating, all in one gift! What about other acts of faith? Marriage. Moving to a new job and staking your well-being and maybe your family’s well-being on that new venture. Sharing a deep truth about yourself to someone you believe you can trust. Sending your child off to a new school – or to college! Asking someone to the prom. Asking someone on a date of any kind! Putting yourself on the line by showing another person your talent. Today, as you come to the table in faith, we ask that you bring your Connection Cards and your commitment cards for 2019. 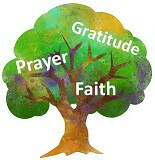 And I ask that you use the post-it notes in your bulletins to continue to paint our trees – we have leaves of gratitude and leaves of prayer and today we are adding leaves of faith. You have awhile to think about it, and I invite you to write on your post-its your answer to this question: In what way are you taking a step in faith right now – this week?